We’d love your help. 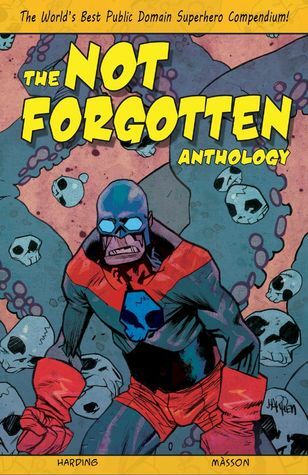 Let us know what’s wrong with this preview of The Not Forgotten Anthology by Matt Harding. Heralded by the success of Superman and Batman, the world of superheroes exploded in the late 1930s with a litany of colorful and often bizarre heroic characters, creating what is revered as “The Golden Age” of comic books. They defeated evil wherever it reared it's ugly head, whether it be bloodthirsty Vampires from Pluto, repugnant Nazi jerks, or the mysterious and deadl Heralded by the success of Superman and Batman, the world of superheroes exploded in the late 1930s with a litany of colorful and often bizarre heroic characters, creating what is revered as “The Golden Age” of comic books. They defeated evil wherever it reared it's ugly head, whether it be bloodthirsty Vampires from Pluto, repugnant Nazi jerks, or the mysterious and deadly effects of Atomic Radiation! These heroes sold books by the millions and ushered in an age of unprecedented JUSTICE. But soon, these ring a ding ding good times came to an end at the close of World War 2 as the heroes fell out of favor in the eyes of a giddy and spoiled public. It was curtains for the heroes, as the once successful publishers now faced bankruptcy and took to the giggle juice while their creations fell into the shadow realm of PUBLIC DOMAIN, a place where anyone, anywhere can use them for whatever nefarious deed their sick minds could concoct. BUT FEAR NOT, TRUE BELIEVERS! These heroes are back and better than ever! Reimagined by top creators in the industry, this anthology collects over 20+ short stories paying homage and tribute to some of the greatest heroes and heroines lost to time with brand new, never-before-seen, exclusive tales bringing these amazing creations back to life! To ask other readers questions about The Not Forgotten Anthology, please sign up. The reason this book is so much fun is simple: creative people allowed to be creative. Fittingly, the book does have the feel of a Golden Age anthology comic, full of old and mostly unfamiliar characters. It's like a treasury of new discoveries. As the introduction promises, there is no worry about continuity or sales demographics. The people involved are just having a blast. While not every story may be amazing, you still know that you're reading something special.